Giants used Hail Mary to Hakeem Nicks at half to beat #Packers in 2011 playoffs. Will Rodgers-to-Cobb Hail Mary propel #Packers today? Unless I'm missing one, Aaron Rodgers is now 4-4 on Hail Mary throws in the past 13 months. Might be #Packers most efficient play. 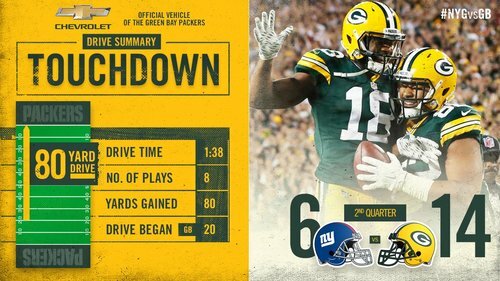 As the second half gets started, read a quick recap of the opening 30 minutes at Lambeau! Jordy Nelson (ribs) is out for the game. #Packers WR Jordy Nelson (ribs) is out for the game. Packers announce Nelson out for game. #Packers WR Jordy Nelson is OUT for the game with a rib injury. Something to keep close eye on if GB advances. #Packers declared WR Jordy Nelson out for the game. Blake Martinez (knee) back in to start the second half. Now Thomas in for Martinez, but looks like Martinez healthy enough to play. @AaronRodgers12 escapes pressure & finds @tae15adams for SIX. 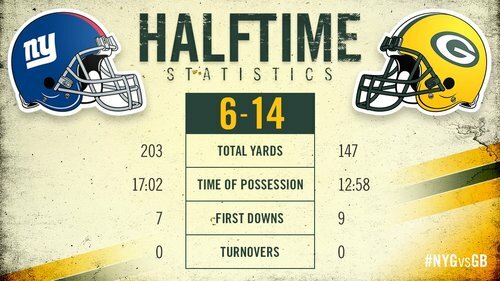 Go figure the difference in this game would be #Packers defense vs. Giants offense. Christine Michael plays exactly like a balloon with all the air being let out. No idea where he's going, but it happens fast. 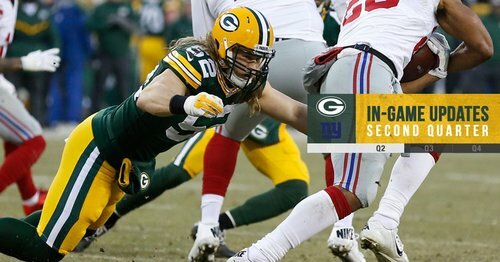 #Packers FB Aaron Ripkowski takes an absolute shot from Giants S Landon Collins. He get up. Just stares at Collins. Going for it or trying to draw an offside? #Packers offense is lining up to go for it, and I can't believe it. Guess Mike McCarthy isn't a conservative coach after all. #Packers go for it on 4th and 1 from their own 43-yard line and get stuffed. Badly. 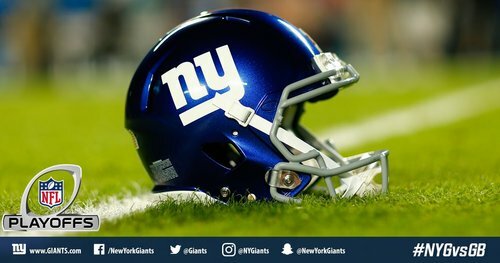 This could be a huge possession for the Giants. I still can't believe #Packers actually went for it. Wow. Didn't like that decision before they ran that play. Wouldn't have liked it even if they'd have gotten it. Just don't understand the risk. Damarious Randall, blown coverage. This is a recording.